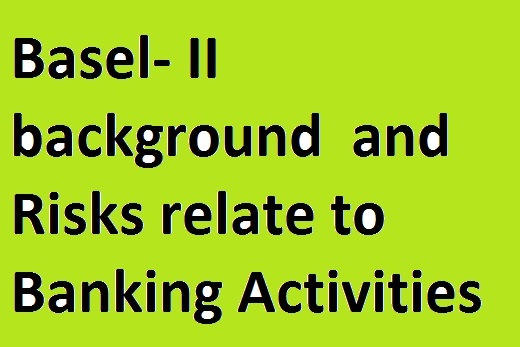 Basel –II framework was finalized in 2004 & it states that bank should maintain capital not only covering Credit Risk but also covering Market Risk & Operational Risk. Here RWA should be calculated covering Market Risk & Operational Risk. The balance of Exchange Equalization A/C. The framework of Basel II captured whole lot of risks and requires banks to develop an Internal Capital Adequacy Assessment Process (ICAAP) and assign an appropriate amount of capital commensurate with their risk profile and control environment. The Basel II framework recognizes the risk mitigates available to the banks for providing relief in the minimum capital requirement for the fact that the discipline exerted by the markets can be powerful as imposed by the Regulator and banks may get forwarded or penalized by the market forces in tune with the disclosures. It governs capital adequacy of banks across the national border. Deals with regulatory response to the first pillar, giving regulators much-improved tools over those available to them under basel-1. It is in the hands of the regulator to monitor and assess the Internal Capital Adequacy Assessment Process (ICAAP) of the bank. Setting adequate minimum internal standards for allowances or liabilities for losses, capital, and contingency funding. Pillar II also provides a framework for dealing with all other risks a bank may face such as –name risk, liquidity risk and legal risk, which the accord combines under the title of residual risk. Greatly increases the disclosures that the bank must make. This is designed to allow to have a better picture of the overall risk position of the bank and to allow the counter parties of the bank to price and deal appropriately. In response to observed weaknesses in public disclosure and after a careful assessment of leading disclosure practices, the Committee proposed enhancements also respond to the Financial Stability Forum’s recommendations for strengthened Pillar III requirements and draw upon the Senior Supervisors Group’s analysis of disclosure practices. Capital adequacy is supported by review of reality of risks relating with banking activities. Risk is nothing but possibility of losing assets through some activities i.e. in case of banking credit activity, market activity, operational activity etc.